For centuries, the inhabitants of the Netherlands have had to protect themselves against the sea and the rivers. The low-lying parts of the country, which are in fact the delta of three major rivers (the Rhine, the Maas and the Waal), have suffered disastrous flooding on many occasions. Dwelling mounds ('terps'), dikes, windmills, sluices and dams have all been used in the struggle against the waters. For centuries, things have gone well. The Netherlands were still rebuilding from the detructive second worldwar and forgot to spend money on the so necessary dikes. And then, in the night of 31 January to 1 February 1953, a combination of a spring flood tide and a hurricane-force northwesterly storm suddenly leads to catastrophe. On the night of Saturday, 31 January to Sunday, 1 February 1953, the KNMI (the Royal Dutch Meteorological Institute) warned to expect a dangerous high tide and a severe storm from the north-west. The high tide was a spring flood tide. The storm continued to rage with wind-forces of 12 (Beaufort) from the north-west. The storm ripped along the coast. Many places were already in trouble. About 2 am, the first water flowed over the dikes. The dikes began to burst about an hour later. The lower and less well-maintained dikes were the first to go. Houses collapsed and were swept away by the current. The rising waters even caused the total destruction of some small villages. 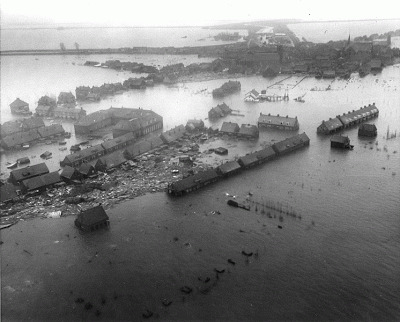 Small villages were obliterated by the water. Not a house was left standing. Wherever the water went, people fled to higher-lying areas. To the dike, to the attic, to the roof. And they waited fearfully for dawn to break, in the hopes that the flood waters would recede. Initially the water receded, after all, it was low tide again. Some people then used that moment to flee from their farms to higher-lying village centres. Individual rescues began. People in boats went along the houses picking up people and setting them off in safer places. Large-scale attempts at rescue organized by outsiders were not yet underway. And at the end of the morning, the water began to once more. The second flood on Sunday afternoon was the worst. The water rose even higher than it had the night before. There was now only one option left: to get up and out onto the roof. Many of the houses that had withstood the night now collapsed. The water simply lifted the roofs off the walls. People drowned, others got stuck. Around five o'clock it grew dark. For thousands of people in the disaster area it was the beginning of a second night of wet and cold and thirst in attics, on roofs, crowded together on the dikes or in higher-lying houses. Throughout Sunday, February 1st 1953, there was very little help from outside. A few reconnaissance flights were carried out over the disaster area. 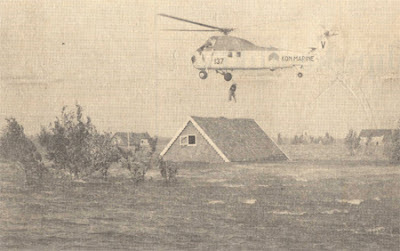 The raging storm prevented large-scale attempts at help from the air. However, even after a day, people were still not aware of the full extent of the disaster. No one knew that larger parts of Zeeland had virtually disappeared under water. More rescue operations got underway on Monday, 2 February. The first villages at the edges of the disaster area were evacuated. On the islands, the only rescuers were still individuals with boats. Fishermen, especially, managed to free many people from their perilous positions. It was not until Monday 2 February that the first relief packages could be dropped. Tuesday was the turning-point. Only then did the rescue get well underway. Victims were evacuated from the disaster area. Hundreds of ships brought aid workers to the disaster area. Food was dropped and helicopters were put into action. By Tuesday evening the disaster had practically ended. 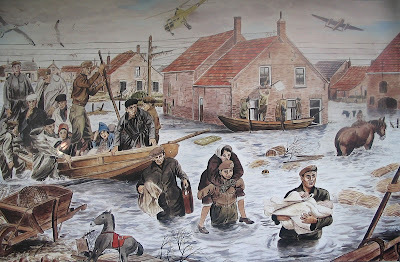 In the night of 31 January to 1 February 1953 more than 1800 people drowned, thousands of farm animals were lost and 150,000 hectares of land were inundated. The nation was stunned by the extent of a disaster unparalleled for centuries. The disaster prompts the launch of a major plan to protect the Dutch Delta (The Delta Works).